America was one of three nations that independently developed the fundamental principles of space travel and rocketry (the others being Russia and Germany). Robert Goddard, Hermann Oberth and Konstantin Tsiokovskii are the three fundamental discoverers of space flight. From 1945 onward, the US was co-equal in developing large space launchers. Despite the myth of Von Braun and the "German rocket scientists", most large rocket development in the US came from indigenous designs and technology, developed by American teams. 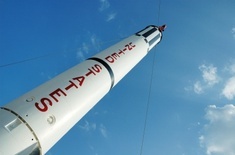 The Germans primarily contributed solutions to specific technical problems in rocketry encountered in the V-2 program. The Atlas launcher, the mainstay of American launches even to this day, used unique solutions distinct from those developed by the Germans. These technologies subsequently became the foundation of the Information Revolution. America’s space-application electronics are still the best in the world. America is also the only nation that has sent unmanned probes beyond Mars to the outer solar system. The services of the GPS are available without charge or limitation to all people on Earth. Its only restriction is that it cannot be used to fire precision-guided missiles in combat without US permission. It then made its technology available to start Intelsat, the original international satellite communications organization. This brought good communications to Third World nations decades sooner than other options would have allowed, and spurred the growth of many of the world’s emerging economies. This now includes the UK and other European nations as partners, as well as Canada, Japan and Russia. This is the broadest participation of any human exploration effort since the beginning of space travel. This includes dozens of firms including Space Composites, which in 2004 launched the first privately financed, privately developed human-crewed flight to space, the SpaceShipOne. This industry now includes companies like Virgin Galactic, launched by the British entrepreneur Sir Richard Branson. This programme, whose hardware is currently under development, envisions a long-term program for exploration and permanent occupation of the Moon and eventually Mars, which will be open to international participation in the same manner as the International Space Station.